There are very few things that say Spring to me like a few stalks of rhubarb do. I am not alone sharing that sentiment just from seeing all the rhubarb recipes posted by fellow bloggers out there. That makes me happy. I do have a little love affair with "la rhubarbe" each year. This complex, fibrous and tart plant is probably one I remember the most vividly about my childhood. I literally grew up on that stuff every Spring and Summer. I can't recall a sunny day without my mother compote de rhubarbe or a vacation without my grandmother tarte a la rhubarbe. I got an early start on my rhubarb baking (crumbles) when I got giddy finding hothouse cultivated rhubarb. But last week's venture to the farmers market with my parents was a success with a bunch pretty stalks of wild rhubarb making their way into our basket. I really wanted to use it before their return to France and thought that a go at rhubarb sorbet would be a good one to whirl but we did not have nearly enough. I was going to acquiesce to my mother stewed rhubarb but I knew B. would never put a dent in it. The mushy texture of stewed rhubarb is something the man cannot stand. I like it on plain yogurt or fromage blanc. As much as I wanted to make my grandmother's rhubarb tart it would have to wait until I am completely happy with the results. There was one elusive whiff of a scent whenever she'd pull hers out of the oven and I have yet to nail it down but I am getting close. Ha! In the meantime, I made one of the desserts I knew would make everyone happy, Lavender Panna Cotta with Poached Rhubarb. There is something about lavender that I can't never grow tired of. I grew up in Provence, surrounded by lavender and mimosa. One look at a lavender bud and I feel like I am six again. Once the scent hits my nose I can almost hear the cicadas in the background and my mom yelling from the patio to get down from the apricot tree. Yes, it was a rather idyllic upbringing. One I wish to share with B. when we move back home eventually one day in our old age. Beside sorbet, this is one of our favorite ways to eat rhubarb, gently poached in lemon juice and a touch of honey until barely fork tender to preserve most of the texture that would be lost otherwise. The contrast with the silky panna cotta both in texture and flavor elicited lots of oohs and ahhs from the table the other day. Lots of fidgeting and eying the kitchen for second too! I had made more panna cotta and had gotten some more rhubarb ready to be chopped and poached for when Tami came to visit but we never got around to it. Too much fun was being had on the town. The house was so quiet after a month of visitors that both B. and I were glad to have a couple of these to dig into to chase the blues away. In a large heavy bottomed saucepan placed over medium heat, bring the heavy cream, honey and lavender buds to a simmer. When the cream is hot, remove from the heat and whisk in the reserved gelatin until it is completely dissolved. Add the buttermilk and whisk until well blended. Divide the mixture among 4-6 cups or ramekins. Let stand at room temperature for 20 minutes and then refrigerate for at least 4 hours before serving to let the cream set properly. Top with the poached rhubarb just before serving. Place the lemon juice, water (or wine) and honey in a heavy bottom saucepan over high heat. Bring to a boil and add the pieces of rhubarb. Poach for 2-3 minutes then gently remove the rhubarb from the poaching liquid and set aside (they will continue to soften as they cool). You can reduce the poaching liquid to a syrup over medium heat and use to drizzle over the panna cotta, it's fantastic. Mettre la gelatine a ramollir dans l'eau. Dans une casserole a fond epais, chauffer la creme avec le miel et la lavende jusqu'a fremissement. 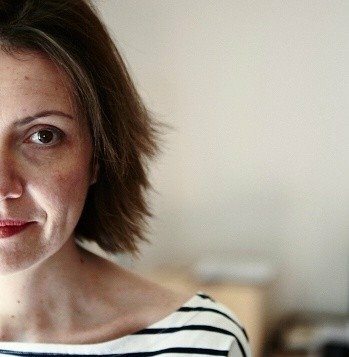 Hors du feu, ajouter la gelatine refroidie et bien melanger pour qu'elle fonde. Ajouter le lait ribot et bien melanger de nouveau. Verser dans des coupes ou des ramequins et laisser refroidir a temperature ambiante pendant 20 minutes. Placer ensuite au refrigerateur de preference 2 a 4 heures. Porter a ebulition le jus de citon, miel et eau (ou vin) a chauffer dans une grande casserole. Ajouter la rhubarbe et faire pocher 2-3 minutes. Prelevez les morceaux du liquide et mettre de cote. Reduire le liquide de pochage de moitie et verser sur les panna cotta avec la rhubarbe. where did you find those cute little custard cups? Oh my!!! YUM!!! 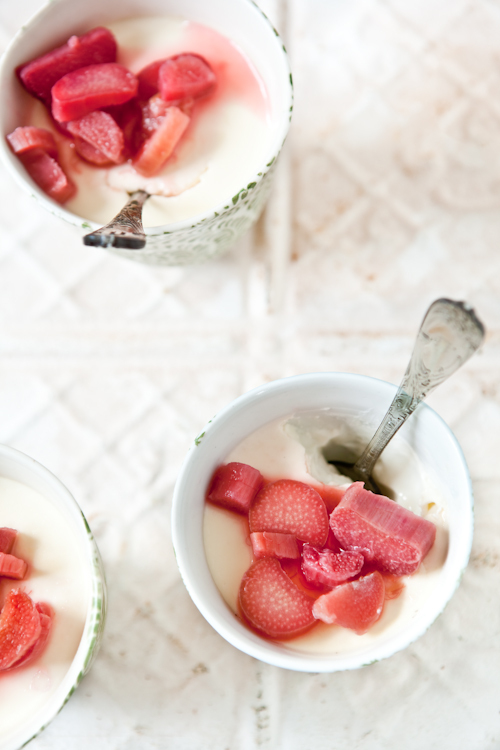 I have been putting stewed rhubarb in my oatmeal and greek yogurt lately.. but this panna cotta!!! I so can't wait until we grow rhubarb here in chicago, warm up already!! What a nice way to serve rhubarb. The pictures are beautiful and perfect to usher in Springtime! Oh, yes! I love panna cotta. We're just home from the US, and as soon as I unpack I'm off to find some rhubarb. Panna cotta!! I can't wait for summer to come. still (somewhat) patiently waiting for rhubarb at my market. crossing fingers for this weekend-drooling over this recipes. sounds divine. baileym: you can find them on Anthropologie. Early birthday present from my parents. I wish I could get some fresh lavender here. Rhubarb is on of my favorite things to sweeten and eat in the warm season. This recipe almost looks healthy (except for the heavy cream I suppose!). Beautiful recipe, as always. 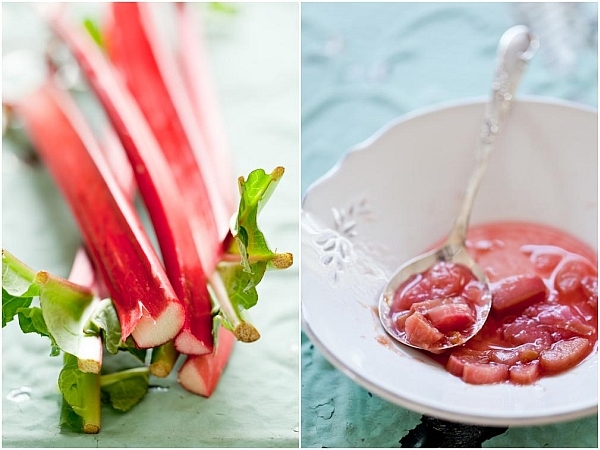 Rhubarb hasn't appeared at our Farmers' Market yet, and I'm already dreaming up recipes for it! I do believe poaching it is the best way to go as it tames the acidity and tartness. Lovely pics! I just wanted to say thank you for the time and effort you put into your blog. I love your ideas and inspirations. I was recently provided a "Sunshine Award" which I wanted to pass along to you as a thank you for all the beauty you bring to all of your readers. It isn't much, but it is a small symbol of my appreciation. Your photography is stunning and your recipes delightful. 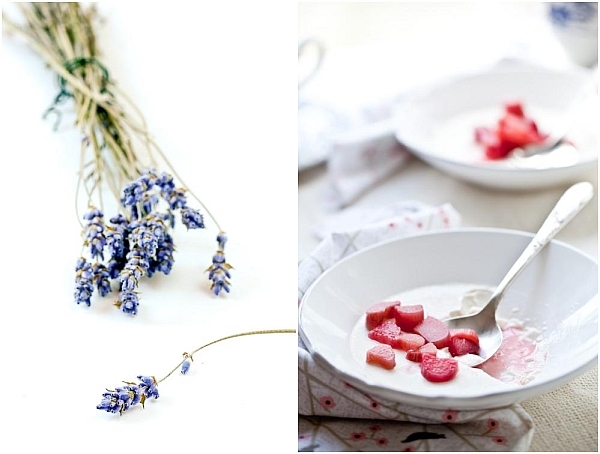 From you I have become addicted to panna cottas and lavender. Thank you for sharing your talents. The world is a more beautiful place because of you. Gorgeous custard cups Helene. Nice way to serve rhubarb. It makes a change from my favourite crumble. I love both Panna Cotta and rhubarb. The combination is perfect! Lavender and rhubarb - I never would have thought of it, but it sounds wonderful. And I grew up always eating it in compotes and crumbles and pies, so this prep is intriguing. And gorgeous, of course! Beautiful. Thanks for the inspiration! oh wow - I also live in Charleston and have heard great things about the Cabaret! So cool! I recently made my first rhubarb and strawberry tart, and have also begun a love affair with rhubarb. Rhubarb is my favorite - any way. Sorbet is a great idea, I'll have to do that soon! Stunning pictures as always and a beautiful recipe. 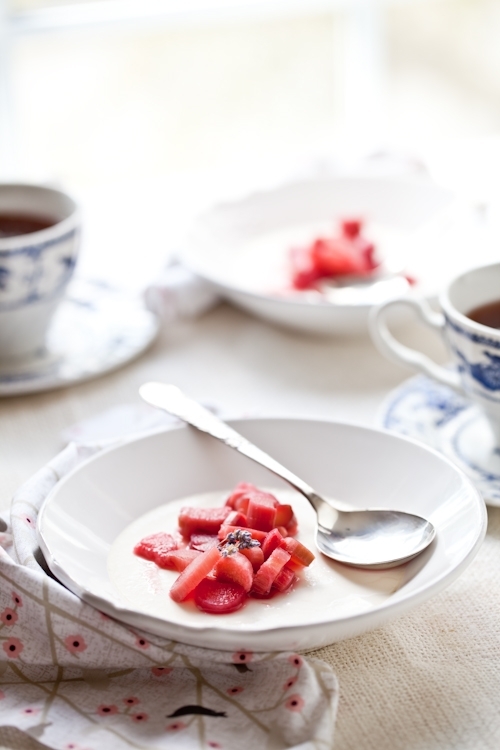 I just love rhubarb and panna cotta is a favourite of mine. I have such good memories of Provence when I visited it a few years ago in winter with the most incredible light. A very beautiful pannacotta, love the red of the rhubarb on the pure whiteness. Also the flavours would be amazing! 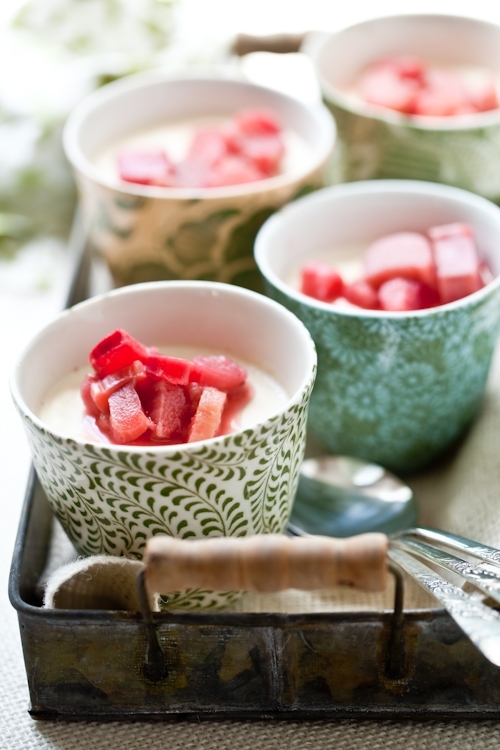 so far the only thing with rhubarb was a rhubarb cake, but your panna cotta is so encouraging! Anthropologie rocks! I've never had rhubarb but I really think I should try it sometime. I am incorporating it into ice cream with my new KitchenAid ice cream attachment. Got it at KaTom. They sell restaurant equipment, but have amazing baking supply prices. How beautiful this is. I am in the process of growing lavender right now. I can't wait to try something like that. HA HA! You said rhubarb! :-D I wondering if someone said "tarte a la rhubarbe" would it have the same effect on me as "rhubarb pie"? I don't know, but this post brought a smile to my face with the pretty rhubarb pieces and that lovely panna cotta. I keep saying I will try one of your panna cotta recipes since I'm always a little afraid of the stuff, but I haven't been brave yet. Shame on me! Helen, I have never tried rhubarb (it's really difficult to find it here), but can perfectly say these are wonderful just by looking! Beautiful desserts. Ohhh!! Very nice fhoto & sweet. Mmmm. Rhubarb brings back memories of my childhood. I have a really hard time finding it down south. Where did you get yours? Beautiful photographs as always. I love your deep dish plate, very pretty. Rhubarb was always the first spring fruit/ vegetable ready in our garden at home. I really miss just going out and cut some stalks. lavender is popular this week ;) Im seeing it everywhere!! beautiful photographs, as usual! I made your panna cotta this weekend and LOVED it. The flavors are so beautifully complex, perfectly evoking springtime. It was like eating a Monet. Thanks for the lovely recipe! What a great flavor combination. Definitely something to try soon! Lavender has a great smell. I'm from the south of France, and nothing is better than the smell of huge field of lavender with the sound of cigale (cicada??). par quoi pourrais-je remplacer le lait ribot, introuvable en France ? Argone: le lait ribot c'est du babeurre (voir les parentheses) que l'on trouve en France mais pas dans toutes les regions. C'est un derive du lait que l'on trouve aisement au Nord de la France. Vous pouvez le remplacer par du kefir ou faire le votre: Pour chaque "cup" (250ml) de lait ribot, versez 1 a 2 cc de jus de citron dans le fond de la tasse et ajouter du lait entier jusqu'au bord. Laisser reposer 5 minutes avant d'utiliser. What a beautiful & lovely special panna cotta!!! I so love this tasty & special dessert!! I do love panna cotta..